A quick video to illustrate how to make a hammock in 3 minutes (or less). The tablecloths come pre-hammed on all the edges, so all that needs to be done to convert them into a hammock is to whip the ends (gather them up) and wrap a continuous loop around the bundle. The video illustrates the “W” whipping method where the end of the hammock is folded in a unique way to create the end bundle. 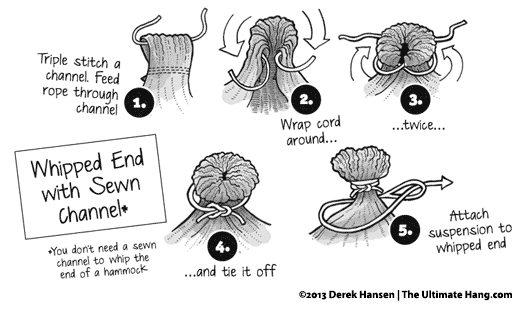 The second method illustrated in the video demonstrates sewing a narrow channel on the ends and using a zip tie to gather the hammock before the continuous loop is used to whip the end. The final method I discuss briefly is sewing a channel where the suspension is threaded through. If you plan on sewing a channel, be sure to use the stronger Gütermann thread. Great article! Would be fun to do as a project with our scouts. Any suggestions for some easy and inexpensive straps and hardware to hang them with? This is exactly what we’ve been doing in my troop this past month: making hammocks! We were able to get some Bull Line and Mule Tape — a partial roll — from the utility company. This was super inexpensive and the straps are perfect. No hardware needed. We cut our straps about 7 feet long a piece and tied a figure-8 on a bight on one end and the other end is free. This way we can use the strap as the suspension. 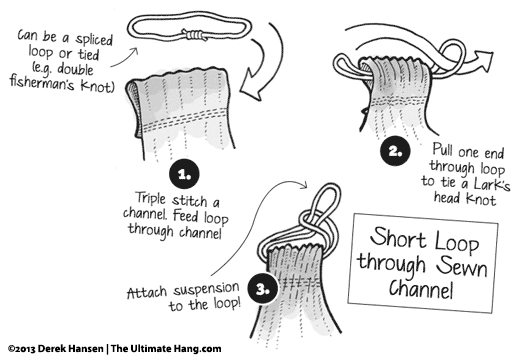 I’m teaching our scouts to use the Becket Hitch (aka Sheet Bend) through the continuous loop. Thanks for the video, Derek. Is the W-folded end really secure? It surprises me that the constricting continuous loop is enough on a slick crinkle tablecloth. I’ll probably do the second method you demonstrate so that I’m not worried about slippage. Yes, the W-whipping is secure, or you could just bunch up the fabric too. You do have a good point: some fabrics are too slippery for a simple whipping like this. When I made hammocks for my kids years ago I used a lightweight ripstop nylon and tried a simple whip and it was too slippery. So yes, only use this simple whipping on fabrics that are thicker and less slick! The simple channel method (non load-bearing) is very secure as a whipping and is my preferred method. This method takes a little more than 3 minutes as you will have to sew a single straight line stitch on both short ends, but it isn’t that difficult or time-intensive. Very informative video! What are the height/weight specs for the 60″x126″ material? I’m 6’3″/250 so I was wondering if I needed to use a larger piece of material and if I needed to look for a different material all together. Your thoughts? Generally speaking, I would recommend a larger hammock. There is a 90-inch wide tablecloth that might interest you. If you have slept in other hammocks you will know best on what is most comfortable for you. Derek, where do you get your tablecloths from? Do you have a problem with your young scouts loosing the rope at the end that the suspension hooks to? Another Zip-tie to keep it on? No issues with the tablecloths, but I won’t guarantee it won’t slip because there are all sorts of fabrics and end ropes to pick from, and some may slip. When I made hammocks for my kids, years ago, I used a ripstop nylon fabric and when I gathered it up it compressed so small that there was no “bundle” or stopper big enough to hold the end rope. I had to add some extra pieces to bulk up the ends. For thinner fabrics, I recommend sewing a channel and using the zip-tie method. This creates a donut-style bundle at the end that works much better as a stopper. Thicker fabrics like the tablecloths work pretty good with a simple whipping. The type of rope you use for the end loop also makes a difference. Smaller diameter rope will cinch down smaller and tighter and be less likely to slip of. I like the smaller 7/64″ Amsteel loops generally speaking for these types of whipped ends. So I made a tablecloth hammock for my wife today using the second method you show here. It turned out great. I’m surprised how big and wide and comfortable it is compared to my Hennessy. It’s so open. I think I’ll need to make a couple more of these. Fantastic! I’m glad it worked for you. Adding the small channel is the way I prefer to do it. Still pretty quick to make. There are a few trade-offs the Hennessy has to make in order to have such a streamlined kit. Each has a place. Jon, there is no definitive source yet on the weight capacity of a tablecloth. I have written to some manufacturers who have tested the tablecloths and I’ll post when I hear back from them. I think they are about the same capacity as “parachute nylon” hammocks, safe within 250-300 lbs. Thanks Derek. Just let me know when you get your reply from them. Actually, I got my reply last night. My friend Randy from Dream Hammock (http://www.dream-hammock.com/) was the person who “discovered” the tablecloth that is now commonly used for making this style of hammock. Here is what he said from his own testing. From his reply, I would say a 300 lbs (136 kg) capacity is within the safety margins. Thanks again, great information Derek. I believe we are going to make this a project for our scout troop! Happy Hangin! Would a 90×156 = a “double” hammock or is that overkill? My first tablecloth hammock was that size. It is huge! But very comfortable. Do you have dimensions for adding a stuff sack to the side like the commercial brands? (For the 60×126)? Yes! My instructions for making a double-sided stuff sack will get you there. If you don’t want double-sided, just sew up on end. The crinkle taffeta material will be great, but you’ll still need to insulate the hammock. Your sleeping pad and bag will still work fine, but it can take some tweaking to get some cold-prone areas like shoulders and your derriere. I’m working a post on a primer to cold weather hammock camping this week so be on the watch for it. I think you are good. I think I purchased one of these tablecloths by mistake one time and the hammock actually worked very well. That said, I cannot speak to the weight capacity of that fabric, so you will have to do your own testing or risk management. The sizes will certainly work. Followed your directions using the stitched channel method. They turned out great and the kids love them. I used paracord for the support lines (and yes it works). I took a 100′ of paracord and cut it down to 4×25′ and then doubled up the lines. I tied a double 8 on a byte and then tied a standard knot about every fist width for adjustments. Then I ran the double-bytes through the gathered end and crossed it over twice before looping the working end through the byte…pulled tight and done. If I could attached pics, I would. These are going to work out great this summer for our kayak camping trip on the Shenandoah River. Thanks for the great page!!! Hello ! i made an hammock with this method, using an old semi synthetic curtain; all is ok but the center of the hammock is uncomfortable, because the center is tighter than the sides.It’s possible to do another way ? Very interesting. Did you sew a channel in the ends or just whip it together? Can these tablecloths be used as a tarp, by waterproofing them? I suppose, but it would be a lot of work. You can buy waterproof fabric for cheap and make a better tarp. Thanks for posting this. I made one for my nine-year-old son using a polyester tablecloth. At first I used the folded and whipped method, which worked great for him, but the line started slipping a bit when I sat in it, so I went ahead and upgraded to the sewn channel and whipped method. Now I just need to make one of your stuff sacks to store it. Derek – Is there a noticeable weight and/or comfort difference between the 60×126 crinkle taffeta and the 60×126 polyester? I would imagine that they are pretty close. Other than color, any pros/cons to one over the other? About to take the plunge with my scout troop and start manufacturing hammocks for all the boys to use on an upcoming wilderness trek. Thanks. Yes. The Taffeta is a nylon material. It’s a little more stretchy. The crinkled nature of the fabric gives it a softer hand. The polyester is going to be stiffer. Some folks may like that better. It doesn’t sag in the middle as much. Very interesting video. What does that weigh ? The weight on a tablecloth hammock varies depending on the material you source. Generally, expect around 20 to 25 ounces. Just made 3 hammocks and am ordering more. I want to make a double layered one so I can put my insulation between. Have you tried this with the home made hammocks? Just sew two blanks together. If you sew end channels, be sure to include both sheets. Would a sheet bend work to attach a continuous loop to the hammock itself? Im gifting these to friends and worry about the lark’s head slipping. If you sew and end channel, it will be more secure and is what I would recommend for giveaway hammocks. Derek, Where do u buy your table clothes from? Just use the same ones I’d find at Walmart? Also, I just bought a old hammock stand. I can’t find any hammock to fit it because on each of the 2 ends there are 2 hooks to support that end of the hammock. (4 hooks altogether- 1 for each corner of a hammock). Do u have any ideas for this? In the post, I link to the tablecloths factory, in the materials section. They have great prices and materials. Email me a photo of the stand and I’ll take a look. Nice…just made my hammock in 45 minutes — including heading out the thrift store for the table cloth AND the hardware store for some rope and back home and all set. Thanks! Have you ever made a gear hammock out of one of these table cloths, or do you have any idea what size would make a good under hammock gear sling? I’m thinking of a small hammock under mine, or under my tarp somewhere/somehow to hold my backpack, etc. off the ground. Thanks! Yes, you could make a gear hammock out of a tablecloth. Check out the dimensions and information I posted on my recent review of the UBC gear hammock. So you could shorten the length of an existing hammock by just gathering a new end further up and just whipping it? A 1.0 oz nylon fabric is stretchy but good for those under 200 lbs. 1.5 oz bumps up a little more strength. Anything from 1.6 to 2.0 is pretty common weight for many camping hammocks. When you get higher than 2.5 oz, you start to get the taffeta fabrics used with ENO hammocks that can hold up to 400 lbs and more. I’m presuming that by “bag” you are referring to your backpack? If so, that shouldn’t be an issue with any of these fabrics, so long as you don’t exceed the weight limit recommendations. If the autocorrect demons overturned your word and you meant “dog”, well, I’m not sure what to tell you. I don’t recommend that folks bring their dogs into their hammocks with them. Because dogs’ claws do not retract, there is a real possibility that your pet can damage your fabric. I’ve seen this many times where hammocks are ripped through because of this issue. Some pet owners will purchase a separate hammock for their dog and hang it next to them, allowing that hammock to get punched with holes. The lighter weight of the animal is usually not enough to pull the hammock apart, even when riddled with holes. At the Texas Hang I participated in last year, one hanger mistook his dog’s hammock and when he sat in it, it ripped in half due to all the little holes. All I can tell you is be careful 🙂 Maybe get the toughest fabric you can find (2.5 oz +) and/or be careful about your dog’s movements in the hammock. By “two person” do you mean a “double” hammock like you see with ENO, Grand Trunk, and others? Let me clarify that a “double” hammock doesn’t mean it is built to comfortably sleep two people, unless you like synchronized sleeping and like being squished together 🙂 The “double” hammock is just bigger than the “single”, usually in width. A common size is 10 x 5 feet (3 x 1 m). DIY Gear Supply sells a lot of great fabric options, and since you can buy it by the linear yard, what you’re looking for is the width. A 60-inch width is common with many fabrics, but they aren’t pre-hemmed. Plan to hem the edges using a simple rolled hem. I would recommend an uncoated fabric. Coated or waterproof fabrics are waterproof on both sides, meaning, when you perspire and release insensible water vapor, it will collect inside the hammock. This will create wet, damp areas in your hammock (condensation) that can be mildly annoying or hazardous. Breathable, uncoated fabrics allow your body vapor to be released. Making straps is extremely easy. You can get the material anywhere (just be sure to check the load rating). Sewing a loop on one or both ends is trivial. I would allow 3-4 inches (7-10 cm) for the sewn area. Use a simple single stitch or a bar tack stitch and sew a few “X” patterns or a series of zig-zag lines. You MUST use tough thread. I recommend the Gütermann Tera Tex 50. For rope, are you using this as the suspension line between hammock and strap? There are so many options that would work it would be hard to recommend just one without further details. Do you want lightest and strongest? Reasonably priced? A lot of folks use 7/64 Amsteel and splice loops or make Whoopie Slings for adjustability. It is reasonably priced and is one of the lightest, strongest options. Spectra line is also very small, light, and strong. I typically avoid paracord because these nylon ropes have significant stretch when wet, and moderate stretch when dry. First off thanks for all the advice on this and when I said bag I did mean my backpack, the main reason I wanted a coated fabric is that I want to add a zipper so it can be a hammock that kind of has a tarp and bug net just by zipping it, because bugs couldn’t get in and rain wouldn’t either I was going use the rope and webbing to make straps similar grand trunks where it has a webbing part on the end so the tree isn’t killed from the rope and I won’t be sleeping with a partner I just want space in the double hammock regarding the rope I want the strongest I don’t care about weight because I don’t backpack very much I just use it to camp with my family and scout troop the reasoning behind a multipurpose hammock is 1 I’m tired of kids waking me up in the middle of the night to ask if they can use my tarp and either won’t leave me alone till I do and I’m tired of always adding new stuff to my bag not to mention it will help with my troop swinging me because I’m the first set up and last out everytime. I have an idea that I want to run by you. I am sewing 2 table cloths together so I can fit a sleeping pad in-between. But what if I sew a thermal space blanket between the table cloths? 1. Do you think that I could still get it into a stuff sack? 2. Do you think that the mylar would be a good replacement for a sleeping pad? 3. If you were doing this, what things would be you be careful with or do or not do? Mylar is an okay thermal reflector but it isn’t breathable and you will have some condensation issues. Before I would sew it up I would put the Mylar in and test it and see what you think. Thank you Derek. I’ll sandwich the mylar but not sew it and see what happens. Do you ever have condensation issues with a sleeping pad, under quilt, sleeping bags, etc.? If so, what do you recommend to minimize this? No issues with a bag or quilt. They breathe well. Some pads might get clammy depending on conditions. Have you seen my post on a DIY weather shield? Not yet, but I really haven’t had the time to give it a proper test. I used the same logic that the Columbia clothing people did; as long as you have breathing space between your strips (dots in their case) it seems to negate moisture issues. The thermo shield is between the reflective strips and the hammock; plus the small air space B/T the underquilt and hammock would seem to me to be a high percentage to remain dry (although that is the “just in case” reason I used synthetic insulation instead of down) . Ok, We just had a scout campout (close to home) and it took us down to 34 F…I had no condensation problems, but, I wish I had made it a little longer than five foot, as some parts were always chilly. It seemed long enough when in the laying out stage but shrunk up a lot when the cords were in place (due to bunching I guess). Hi gathered the ends of a crinkle tafeta poly table cloth w some nylon cord in the hem and added 7/64 amsteel loops. The polyester failed under the loop I go the sence that the loop cut into the fabric under 300lb load. Is that possible? Yes. I would rate the fabric at 250 lbs. I made a ripstop hammock using zip ties through channels on the ends. On a 300-mile segment of my hike last year the zip tie broke. I knotted the end of my hammock–easy fix for the rest of the segment, but I will never recommend the use of a zip tie for a hammock gather. The zip tie gets brittle and breaks. Interesting. I’m glad you’re safe and you found a good workaround. I suspect the zip tie might be the weak link. Other manufacturers use them in their hammocks without issue, so it might be important to note the type or quality? It is also curious because the zip tie should be covered almost entirely from UV exposure if it is in the channel. Any other insights you can provide as to why how where the zip tie broke? I thought the zip tie was the gods’ gift to hammock makers. I discovered the break as I eased myself into the hammock after set up–I’m glad it didn’t happen in the middle of the night. 3. I always stored the hammock within an hour of use. The first & last lemon, as no others had broken before–I’ve switched the rest over to 1/4″ cord to provide the bulk in the channel. If someone showed me a “premium” zip tie, I wouldn’t buy one, b/c filing the cut edges after removing the excess length slows the build. I girth hitch my whoopies just below the channel, not on the channel, though it could have shifted to apply pressure on the zip tie. I recall that the tie broke right next to the tunnel. Can you not just fold the end of the table cloth over and throw a sheet bend on there? You could even sew it that way for strength. I am just wondering how safe/secure that would be. I have done it in a cotton sheet for the kids. Seems very secure, but my google-fu is failing to come up with an answer. Yes, but it depends on the materials used. Slippery dyneema isn’t recommended but other rope should hold fine. This is what I do when I make hammock chairs on the trail. I love this simple hammock design! My first one I sewed an end-channel but on subsequent ones I have simply used a zip tie to gather the ends which allows me to experiment quickly with various folds and gatherings. Below the zip tie I have a thick continuous loop in a prusik knot that hasn’t budged in the year I’ve used it. Maybe you should call it the 1 minute hammock. Thanks! Derek, what’s the purpose of the W-fold whipping? I’ve seen this before, but never seen an explanation of what it does or why to use it instead of the zip tie method. It is used by Hennessy. Some folks felt it minimized the calf ridge or helped form a foot pocket. From my experience it is simple a way to easily flatten the fabric on a Hennessy so they could be sewn or fused. If you’ve seen a Hennessy end cap you know what I’m referring to. That makes some sense. I currently have an HH explorer, but really feel some hyper extension in my knee when I use it. The only way I can really sleep in it is in the fetal position 90* to the RL. If I use two of the crinkle taffeta fabrics and sew them together, is it significantly more weight to where 2 people could sleep in it without a problem? My friend and I slept ina. Crinkle taffeta hammock and it ripped so I was wondering if adding the second layer would help? Two layers would bump the weight rating. Did you see my post on double layer vs. single layer hammocks? There is a calculator there from dreamhammok.com to estimate weight ratings of double layers based on fabric type. If the rip occurred on any sewn seam, be sure to use high strength thread and reinforce load bearing seams. We just did this with our troop and it was a great project. Used the mule tape that we bought off ebay, and amsteel to make the continuous loop. One thing I would caution about is that the fabric from the tablecloths suggested was not very durable. More than half of out hammocks ripped on the first use. Some down the middle, most by the knot on the end. The fabric felt very cheap, and I guess it ended up being so. Not sure that I can recommend doing this project with the source provided, but the concept, and the process are great. Just need to find better material. Thanks for the update on the fabric. I wonder if their source has changed. Bummer to read about the declining quality, considering that each tablecloth costs $10 and 3.5 yards of ripstop from diygearsupply costs as little as $12 (1.1 oz seconds in royal blue today). I’ve never had trouble with diygearsupply fabric. Mine ripped at the larks head or whipping point almost immediately. Pretty sure the 7/64 amsteel cut through the fabric. I have since added a more durable layer or sheath in that area and am using a prussic rather than a larks head to spread the pressure. Going on 8 mos. w/ no problems. Also there is nothing a scout troop can/will not destroy. I think your main problem might be resilience of youth.